Do you like listening to online radio? Find out how you could use your favorite web browser to search for radio stations using your favorite search engine. If you are using a Linux, then there are a whole array of packages which provide access to a selection of online radio stations. In this guide, we are going to introduce you to Cantata which provides a simple user interface and access to more radio stations than you can throw a stick at. We, of course, never advise throwing sticks at radio stations. Cantata is more than just a method of listening to online radio stations and is a fully fledged MPD client. For this article, we are promoting it as an excellent way to listen to online radio. You should be able to find Cantata in the repositories of most major Linux distributions. You may need to use the 'sudo' command if you get a permissions error while using the above commands. You can see a screenshot of Cantata at the top of this article. 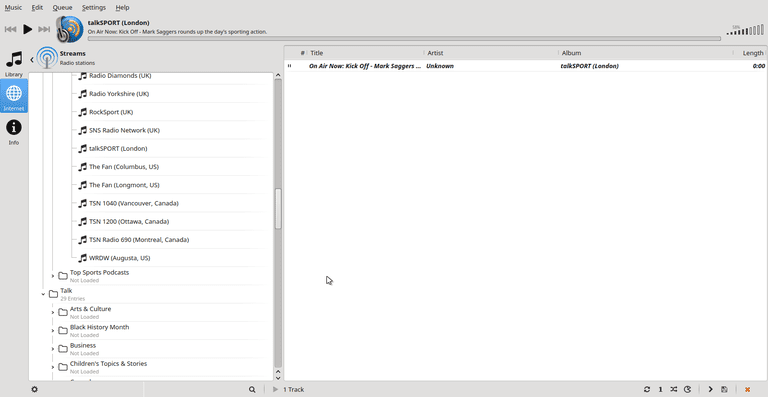 There is a menu at the top, a sidebar, a list of music style platforms, and on the right panel exists the track which is currently playing. The sidebar can be customized by right-clicking on it and selecting "Configure." You can now choose which items appear on the sidebar such as the play queue, library, and devices. By default, the sidebar shows internet and song info. If this is your first time using Cantata, you will have no favorites set up, so the Tune In option is the one to go for. You can now search by language, by location, local radio, by music genre, by podcast, sports radio stations and talk radio stations. There are categories within categories, and within each category, there are loads of radio stations to choose from. To select a station click on it and choose play. You can also click on the heart symbol next to the play icon to add the station to your favorites. If you want to listen to a whole wave of free music from various genres, then choose the Jamendo option from the streams screen. There is a 100-megabyte download to download all the available categories and metadata. Every conceivable musical style is catered to from Acid Jazz to Trip-Hop. All of you trip-hop fans will be psyched to read that. Remember this is free music, and as such, you won't find Katy Perry or Chas and Dave. If the Jamendo option doesn't provide you with what you were looking for, then try out Magnatune. There are fewer categories and fewer artists to choose from, but Magnatune is still worth checking out. If you want to listen to something more mainstream, then click on the SoundCloud option. You can search for the artist you wish to listen to, and a list of songs will be returned. If you are working on your computer, it is nice to have some background noise. The trouble with using a web browser is that you can accidentally close the tab or the window while doing something else. With Cantata the application stays open even when you close the window which means you can carry on listening.